Cardiff Devils produced a stunning performance to crush Vaxjo Lakers in the Champions Hockey League on Tuesday. The Swedish champions had already qualified from Group E while Devils are mathematically out of the running, but Lakers were still chasing top spot. Jake Morissette, Sean Bentivoglio and Craig Moore put Devils in command. Linus Högberg's goal briefly threatened a Lakers third-period comeback, but Joey Haddad replied almost immediately before Mark Richardson added a fifth. It was a great night all round for British ice hockey, as Nottingham Panthers beat TPS Turku 2-0 in Group F to qualify for the play-offs. Devils began this season's Champions Hockey League campaign with a 10-1 loss at HC Davos, before heavy defeats home and away against Bili Tygri Liberec. 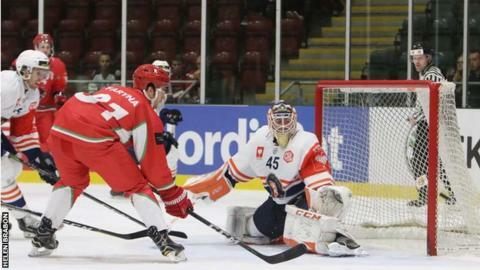 But Andrew Lord's side turned the tide with a 4-3 home victory to claim an historic first CHL win in their last outing and now have a morale-boosting second success. The return fixture with Lakers in Sweden is on Wednesday, 11 October. Before then Devils face Belfast Giants in the Elite League in Cardiff on Saturday.